Our product range includes a wide range of sandwich panel for roof. To accomplish the diverse requirements of our valued clients, we are engaged in manufacturing and supplying Sandwich Pane for Roof. This sandwich panel is tested in terms of quality in order to dispatch a perfect range at customer's end. This sandwich panel is manufactured by finest material keeping in mind the all industry standards. We offer this sandwich panel on numerous customized options for meeting the demand of customers. 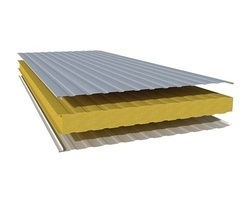 Looking for Sandwich Panel for Roof ?